Last week we started talk about pricing, and especially about deciding prices for your handmade goods. As it seems a pain in the neck for lots of us, we choose to study further the topic and introduce you 4 tips to improve your shop’s performance throughout some easy test! Differences are making a difference! It’s common believing that, when someone has too many options to choose from, it’s more probably he wouldn’t choose at all. But, according to a new research made by Yale University that’s not true: if two goods has the same price, it’s less probably that the sale would succeed. 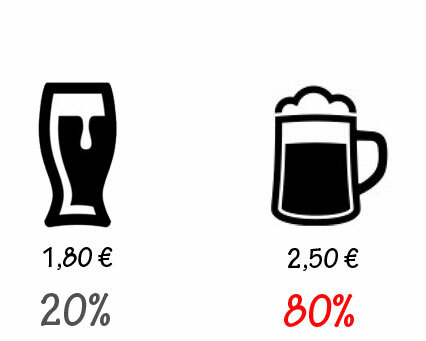 Researcher ask the participants to choose from two products with the same price and then they just slightly changed one of the product’s price: just 46% of the participants decide to choose and “buy” in the first case, while 77% in the second one. Now, before you automatically decide to change all your shop’s price, try to have a reasoned approach. If you are selling similar but slightly different goods, do same test and try by changing just one price while leaving the other higher or lower. According to William Poundstone, author of the book The Myth of Fair Value, human being doesn’t have any clue about the belonging value of the objects and they form their idea just on external information. Poundstone in his book asks his participants to choose to buy a regular beer and better quality beer: the results are the one below. For the second test, Poundstone adds a cheaper beer. What’s happen? Nobody choose the cheap one, but the number of people who are now going for the regular one has rised a lot, while the high quality percentage has decreased. What that means? Adding a cheap good, through the options highlightes prices difference. 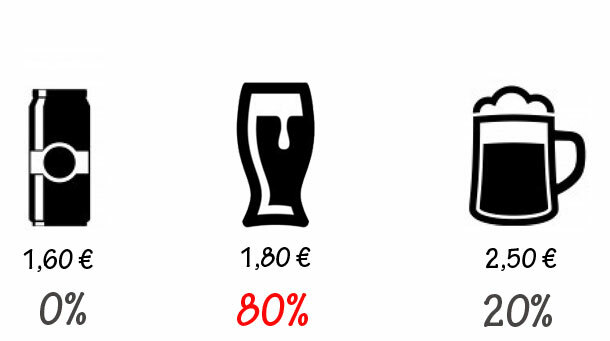 In the third and last example, Poundstone compare a regulare beer, an high quality one and a premium one. 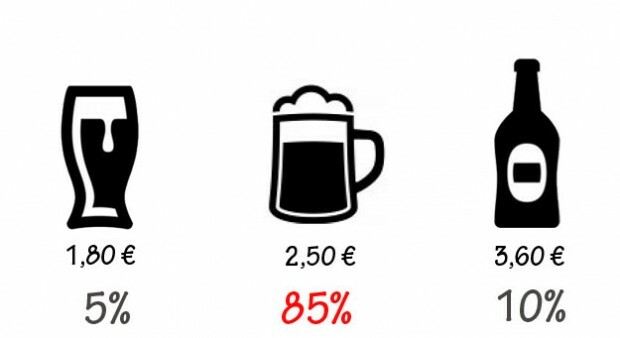 As we can see, just few people choose the premium product, as consequence to the high price, however a higher percentage of people went for a superior quality beer. The purpose of the test is to demonstrate that every good’s price is relative to the contest it’s introduced in. Now you should ask yourself: is my shop enough vary, even about prices? Have my products different stages of prices, or different features and different prices? Have you ever though to sell premium product, together with the standard? 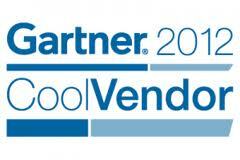 Are your top product different enough from the standard? Last week we suggest you to compare your prices with similar item’s prices. Even if we love to think, that a good product, presented in a professional and friedly way should have it easy, never forget people loves to spend less! According to a study form eMarketer.com, 38% of people who buy online do it in order to save money, while as claimed by Forrester 27% of them would exchange happily the regular cart for online one. Just be careful because too low price arouse suspicions in everyone. Everybody knows what we’re talking about: the ,99 price. So, do you really think that selling something at 39,99 € instead of 40 €, works better? Apparently, yes. But there is even more! Accordinge to a study published by Quantitative Marketing and Economics, during a test, a t-shirt on sale for a 39 € has been preferred by 24% more buyers, compared to the same t-shirt on sale for 35 €. Bizarre, don’t you think? It seems that “the 9 rule” works even in case of sales. As we can see from the image above, even if the second option is not the more convenient, has generated more hypothetical sales.